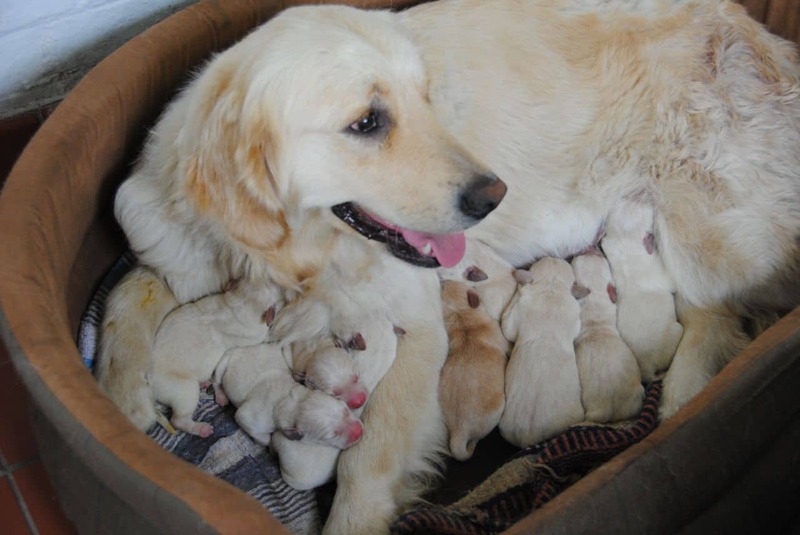 The outcome of the crossing between the two retrievers, the Golden and the Labrador, is a new breed of dog – the Golden Labrador. 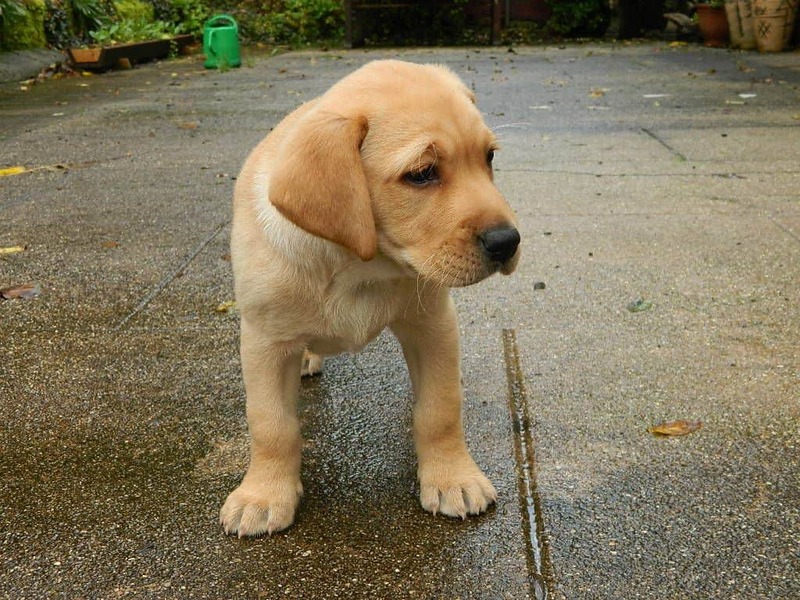 Not being a purebred dog, the Golden Labrador can have any of the characteristics of the two breeds, therefore one needs to search these first in order to establish what the temperament of such a dog is. However, it is not always that such a hybrid dog is the result of a 50-50% cross between two breeds. People often choose to mix more than two breeds across multiple generations. 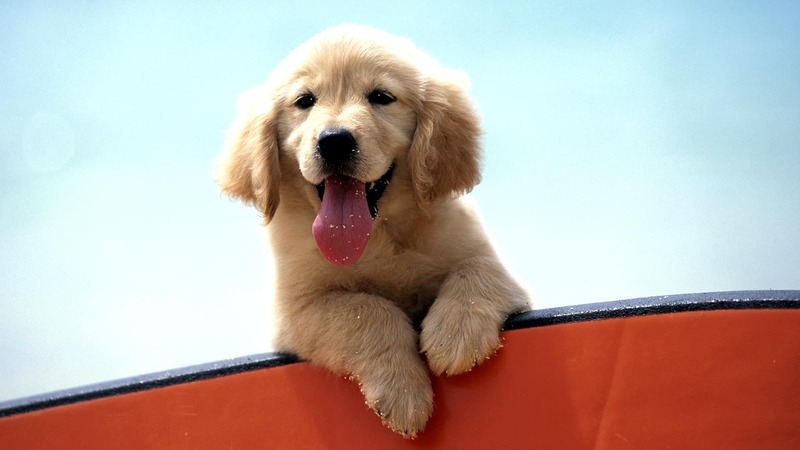 The Golden Retrievers are very popular and appreciated for their increased ability to be trained. Moreover, they are very devoted and loving dogs and easily used for different services like bomb detection or guidance. They get along very well with other animals and children, making them ideal for becoming a new family member. Behind the mixing of a Labrador Retriever and a Golden Retriever stood the idea of obtaining a dog to possess and combine the tolerance of the first with the sensitivity of the second. Judging by all aspects this was a success. Easygoing and also displaying a stunning intelligence, the Golden Labradors rose to the expectations and proved to be excellent for bomb detections, rescue missions and guidance, while also performing very well as service dogs and players as part of therapies. They get attached very quickly to the person next to them and this is what makes them happy, similar to the breeds they come from. These dogs just love to be taken out for all types of games and activities, but they don’t just love doing this, they also need it on a daily basis as much as possible. 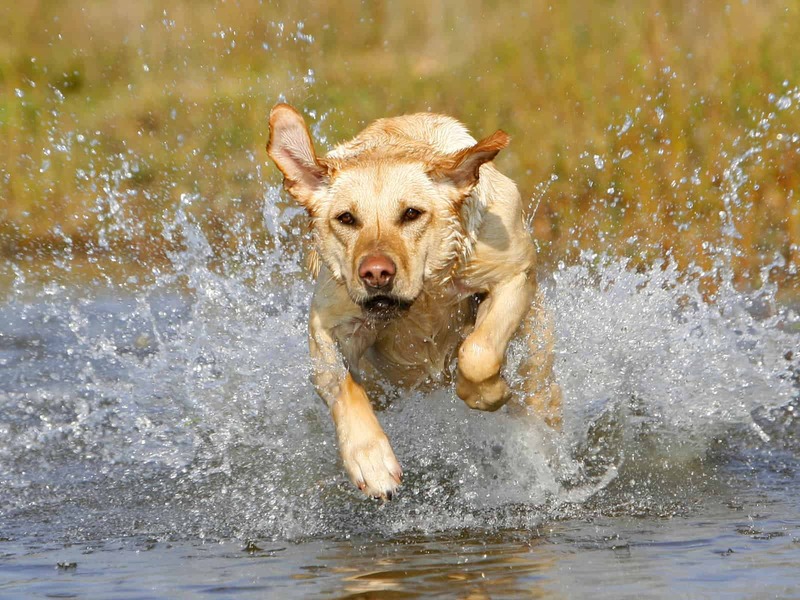 Golden Labradors are good swimmers and enthusiastic players in games that require retrieving. They reach the physical maturity once they are 1 and a half to 2 years old. The training of a Golden Labrador is a very nice and easy part for a dog that has inherited the willingness to work with people. This is a huge advantage for the people who had never owned a dog before, while in return they ask only for care and exercise. Due to their active desire to feel they’re part of a family, they make excellent companions for children. The Golden Labrador feels best living indoor with people, but preferably in houses having fenced yards. However, as long as the proper level of exercises is received and a person is keeping them company most of the time, they can easily adapt to condo or apartment conditions. Allowing Golden Labradors to have the needed exercising permanently is not only a requirement for physical maturity, but also a prevention method for becoming overweight, as they enjoy eating. 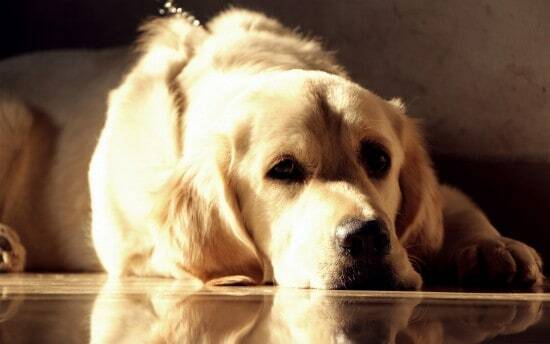 Golden Labradors are generally good friends for children and they easily become good family members. They also get along quite well with other animals including dogs and this becomes easier if they had contact with them from an early age or raised together. Keen on receiving their daily dose of exercise of at least thirty minutes, Golden Labradors are excellent companions for people who jog and they generally love to be outdoors. The Golden Labradors require some attention with regards to their coat, as it is recommended to be brushed on a weekly basis. They shed moderately. 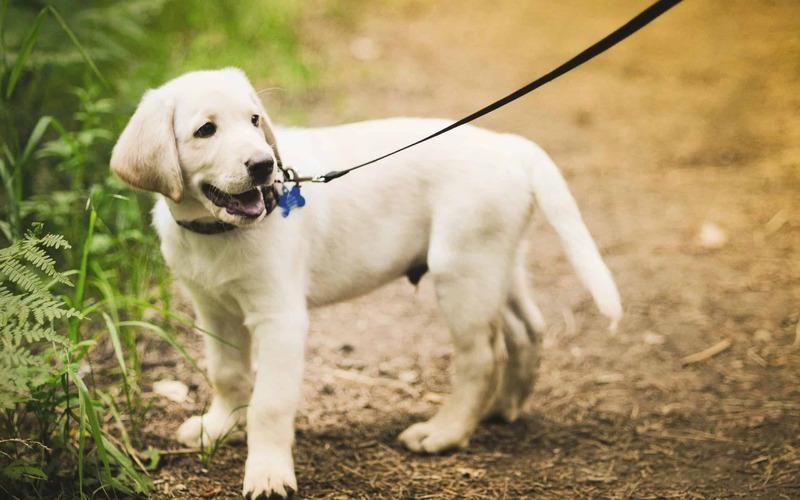 Even if the perfect home for them is a house having a fenced yard, the Golden Labradors are able to adapt very well in apartments or condos, provided they receive the necessary amount of exercise. 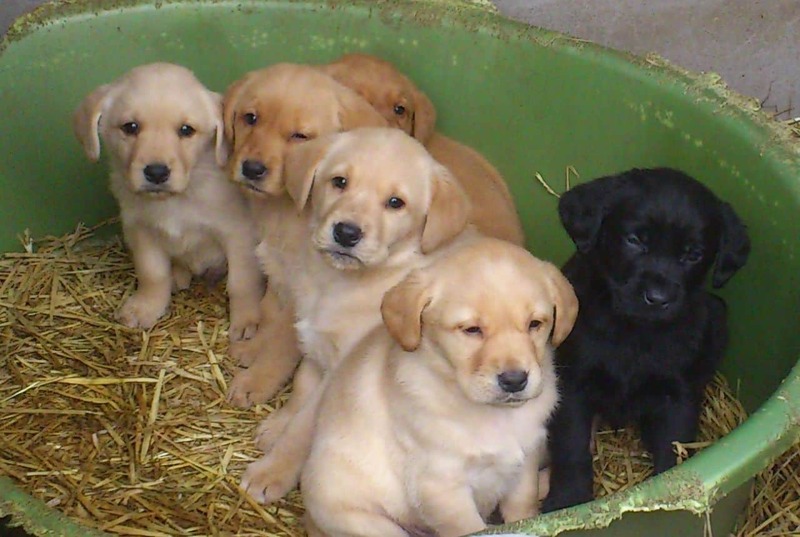 Excellent choices for people who never had a dog before, the Golden Labradors are best to be obtained from a breeder with a good reputation who can prove and check the breeding history so that the dog is safe from genetic diseases that may occur later on or even be passed on to puppies. 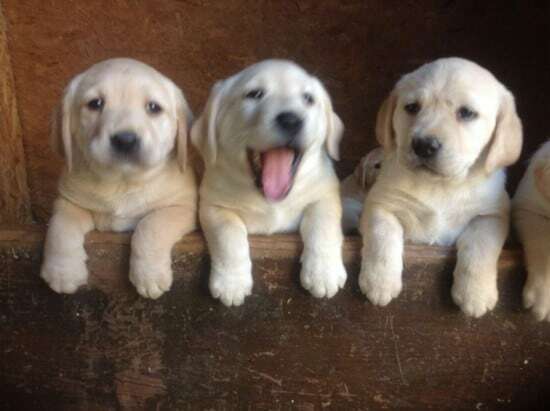 It is best to avoid getting them from pet stores or puppy mills, as only a professional breeder can check the genetic background so the Golden Labrador is up for a sound temperament. It is already more than ten years since the Golden Labrador had first appear, as a successful result for the expectation to create a good, tolerant working dog by crossing the Golden Retriever with the Labrador Retriever, breeds widely used by professional dog training organizations for guidance and assistance purposes. Unlike Labradoodles, a breed of dogs more popular as companions, the Golden Labradors are yet to reach that popularity, also maybe because there are still no efforts to standardize the Golden Labrador cross-breed. 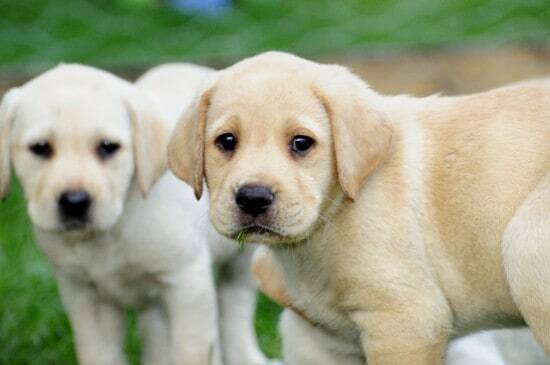 The size of Golden Labradors is easily to be predicted, as both parent breeds are similar in shape and size. The weight for a dog in such a designer breed is between twenty five and thirty five kilos, while having a height of about sixty centimeters at the shoulder. Loyal, friendly and loving dog, but also with a good ability to play the role of a watchdog, the Golden Labrador is rather unfit for a proper guard dog. Especially when growing together, they are very friendly with children and other pets, including dogs. 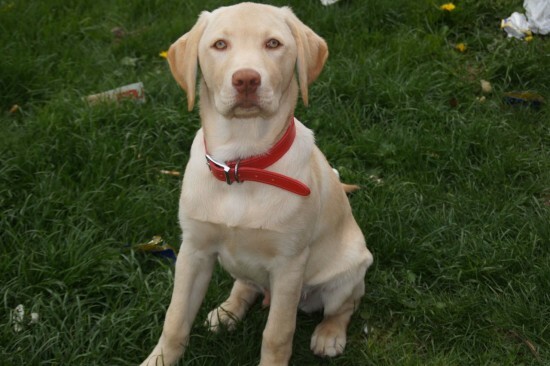 Avery intelligent dog, the Golden Labrador is a very good candidate for training. Responds very well to positive reinforcement and is quite capable of thinking individually, but does prefer to be guided and assisted in life so leaving the Golden Labrador on his own in the yard won’t make him happy. Like in the case of most dogs, the Golden Labradors are best to be exposed early to people and a variety of places and good experiences. Allowing them to socialize from early ages ensures that they develop a good temperament. Like every species, the Golden Labrador too is subject for some health conditions, even if it’s not necessary that all of them are exposed to these. However, as an owner it is best to be aware of such possibilities. 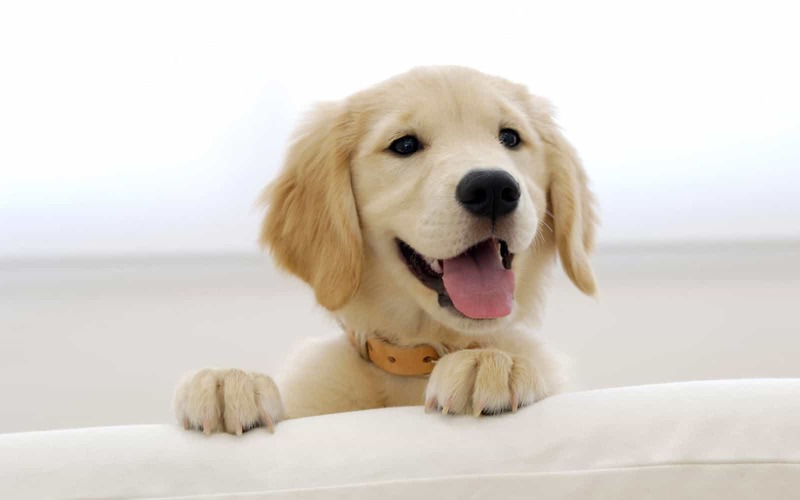 It’s best to start with reviewing the health conditions for the parent breeds, the Golden Retriever and the Labrador Retriever, as here are the roots for any condition passed on to the Golden Labrador. It is important for these breeds to have the thyroid, elbows, hips and heart cleared by the Orthopedic Foundation for Animals, as well as the certification for good eyes from CERF (Canine Eye Registry Foundation). Both in the case of a fenced yarded house and apartments, the Golden Labradors can do very well if the required daily exercises are provided. This ensures not only that the dog is happy, but also healthy. Reputable players in agility competitions and fly-ball games, Golden Labradors are happy with at least half an hour of exercise per day. Besides the physical exercising, the mental one is equally important. Teaching a Golden Labrador to fetch objects or to play with interactive toys for dogs renders him happy. Being sensitive, a Golden Labrador will always be more responsive to good reinforcement and will be seriously affected by any severe punishments or corrections. The daily food portions will be different from dog to dog, depending on the size, age, metabolism and level of exercises they receive, but generally the recommended amount are of about 1 kilo of high-quality food split into two separate meals. 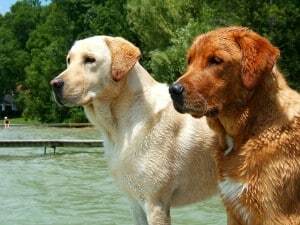 Double coated like the Labrador Retriever (a thick, short coat at the top and a dense and soft coat under it), a Golden Labrador can bear colors from plain yellow to reddish gold, but also black given he’s a cross breed with a Labrador Retriever as a parent. Brushing them on a weekly basis ensures the elimination of dead hairs, but it is also recommended to be carried out even daily during shedding periods. 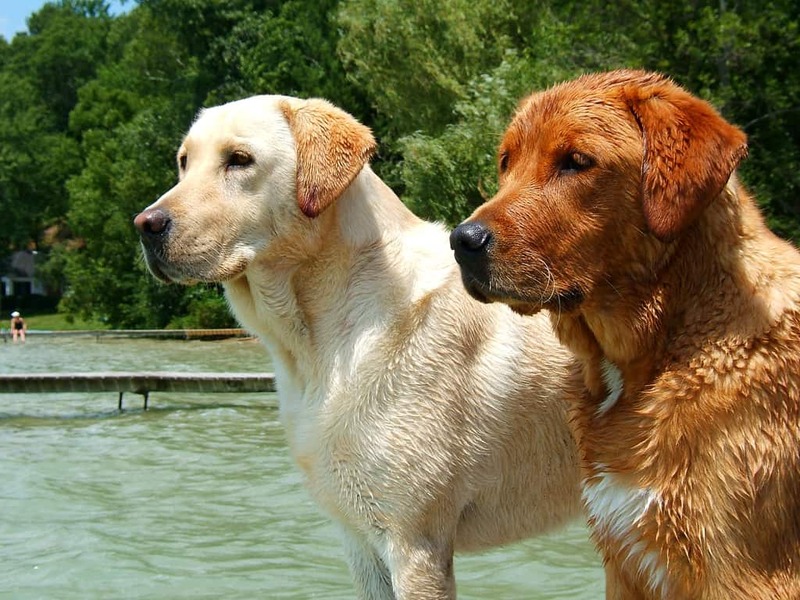 Taking the Golden Labradors for a swim or giving them a good rinse with fresh water is benefic to them. Sensitive and loving dogs, the Golden Labradors are keen on children, thus being ideal family members. Even if when puppies they may knock small children over from a desire to play only, with the proper supervision they can be great playing partners for them. And it is not only children, but also other pets that the Golden Labradors get along very well with, especially when they are raised together. Despite the loving nature of the Golden Labradors, the owners must be careful with the interaction between them and small children and also need to teach the children how to interact with them, as the dog may react in a negative way when and if pulled by the tail or touched during eating or sleeping. In order to avoid these unwanted situations, the children need to be supervised and almost never be left alone with the dogs. I’m interested in one of your puppies. What do I need to do to obtain information about purchasing a puppy?